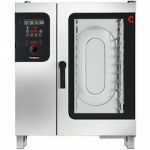 One of the longest running names in combination ovens, Convotherm has been manufacturing combi ovens for nearly 40 years. Based in Germany, they have incorporated innovation in their products from the beginning. They patented the first combi steamer with their Closed System, an energy-saving configuration. They also patented the first "disappearing door" on a combi oven, for safety and less interference with foot traffic in the kitchen. They are still dedicated to making certain that your food preparation is improved by their equipment. 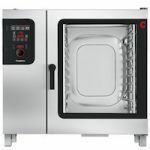 Convotherm combination ovens are available in several different sizes, each with multiple options.